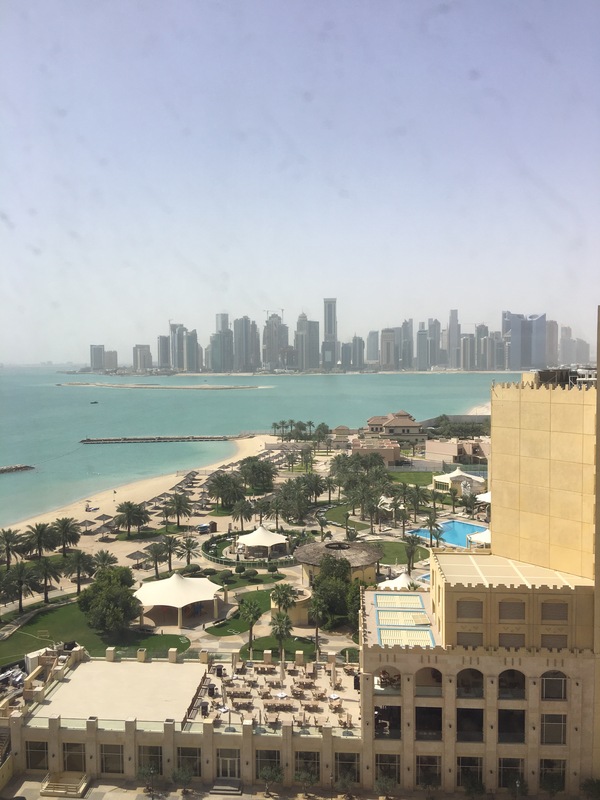 We’ve been to the restaurants and bars in the St Regis so many times but we’ve never actually stayed there so when we were looking at a Doha staycation it was at the top of our list. Booking was easy, I emailed the hotel directly as we were using an Entertainer voucher and they responded within a couple of hours giving me the rate options and that evening we called into the hotel to book the room. We arrived about 11.30am as we intended to use the beach and pool if our room wasn’t ready. Check in was fairly quick but I didn’t find it particularly warm or friendly, I thought we’d be offered a drink or a cold towel which is common in the region but this wasn’t the case. We were given the choice of a room on a lower or upper floor and we chose the latter. As expected, our room wasn’t ready because it was quite early but they said they’d call us when it was. In the meantime we made use of the beach and pool. 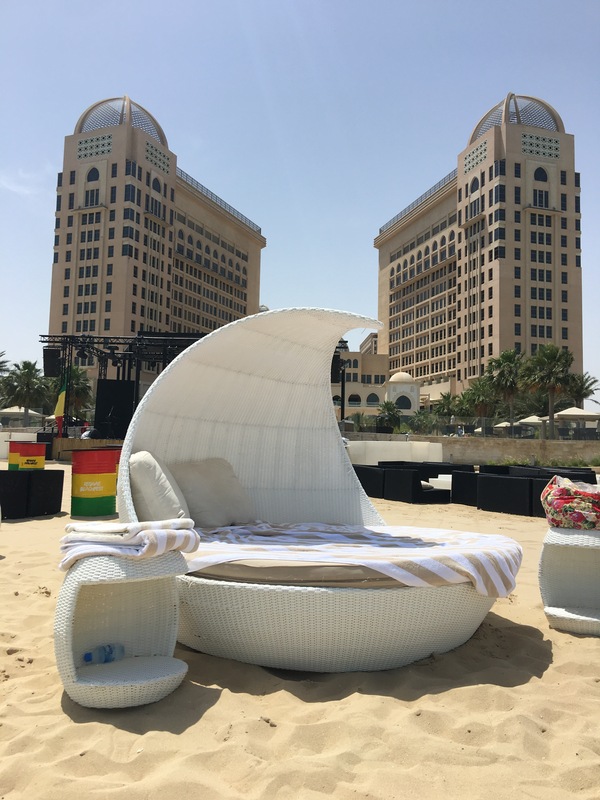 We chose a fabulous double sunbed on the beach as the pool was very busy and we were provided with towels, water and an ice bucket. The beach was fairly clean and the sea was clear for the first meter or so after which it turned to clay which is common for some of the beaches in West Bay. 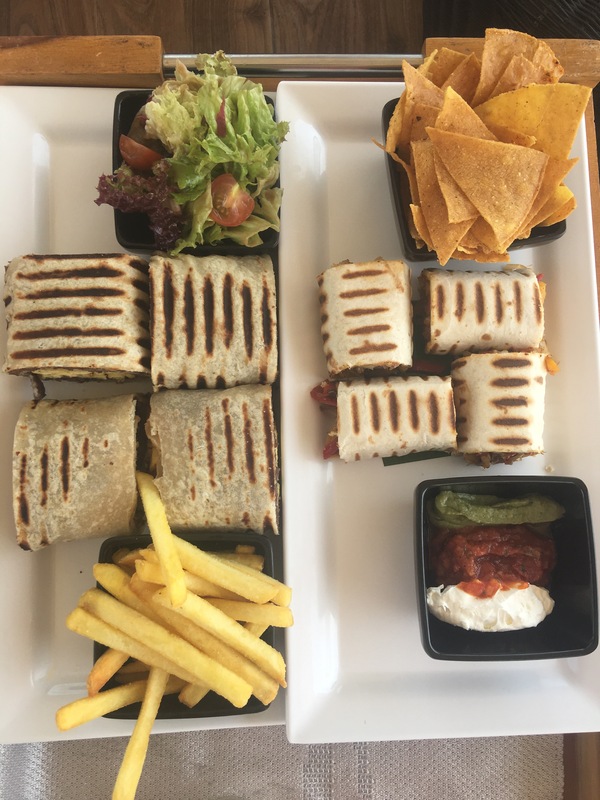 We ordered lunch from Oyster Bay – this is the pool bar and, as food can’t be served on the beach, a table was set up for us by the pool. The chicken Caesar salad and lamb kofta were really tasty and reasonable priced, in fact we ordered lunch from here both days. I did feel that the level of service on the beach wasn’t as visible as by the pool so if you like staff on hand you may want to stay by the pool area. Later in the afternoon we received a call to say our deluxe room with a lovely sea view was ready. It was quite spacious with a small sofa and desk area, lots of storage space – dressing gowns and slippers were provided. We received a note from the butler service and complimentary fruit and water. The bathroom was well-appointed with a rainfall shower, bathtub with TV and good quality Laboratoire Remede products. The bed is one of the most comfortable I’ve ever slept in! On arrival our lights weren’t working and an engineer quickly came to fix them. We also asked for fresh milk and English breakfast tea (a bit of an obsession of mine) which was brought promptly. We decided to eat at the Astor Grill for dinner on the first night, a restaurant we’ve been to several times lately and which I feel has improved significantly over the last year or so. We opted for the 3 course supper menu priced at 225QR each which we felt was very good value for money. 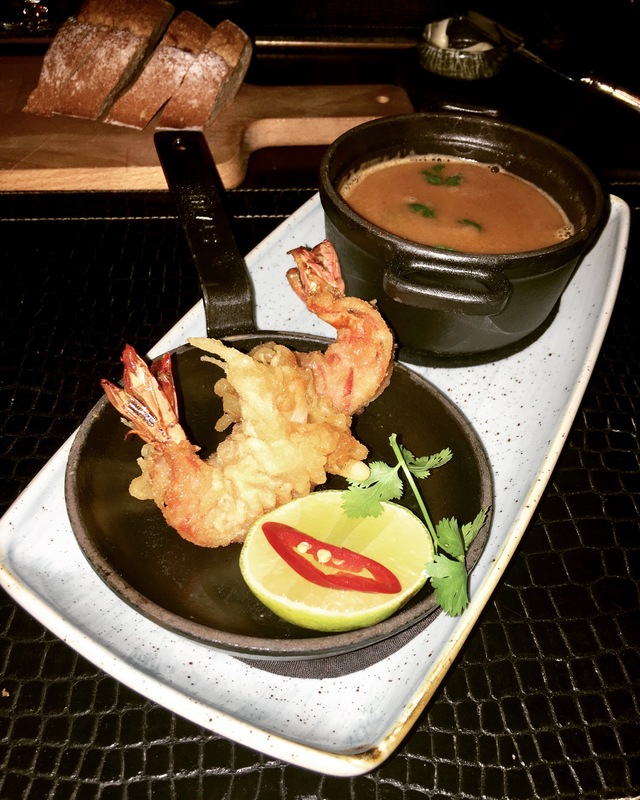 The food, service and atmosphere were spot on, we both highly recommend the seafood bisque with a south East Asian twist! We were able to use an Entertainer voucher with our meal. The next morning we slept late and woke up to this fantastic view. Other reviews have mentioned noise from the nightclub, but we didn’t hear a thing. Maybe it was because it was a Sunday night? We decided to spend the day by the pool as it was very quiet and the weather was perfect. 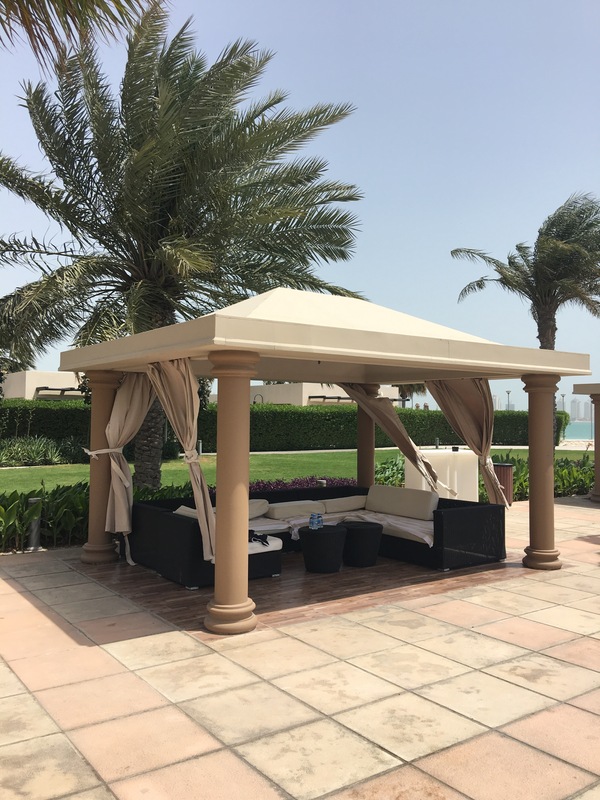 We chose a cabana and another double sun bed, we enjoyed lourselves lounging around and swimming in the fantastic pool. We ordered lunch from Oyster Bay again, the lamb kofta and Cajun prawns with nachos were delicious. We were kept hydrated by complimentary bottles of ice-cold water, which were brought to us by the staff. Late in the afternoon we went back to our room to change for dinner. We noticed that our toiletries hadn’t been replenished so we rung housekeeping and supplies arrived, we were soon ready to head to Opal. This restaurant has a lovely view from the terrace and the weather was perfect to sit outside. There was a BBQ offering a burger / hotdog, fries and a drink meal deal priced at 100QR but we chose from the a la carte menu. The prices here are indicative of the fact your dining in a 5* hotel but we were able to use an Entertainer voucher on the main course. The food was good, especially the ribs and pizza. After a couple of drinks we were shattered; it’s hard work being on holiday! The next morning we decided to have breakfast before we packed. It was our first visit to Vine, the all day dining outlet. We chose to sit inside although they have a very nice outside terrace. The service was good and there was a calm, relaxing atmosphere but we felt the buffet was nothing out of the ordinary. I think for a 5* hotel I expected some a la carte options in addition to the buffet. 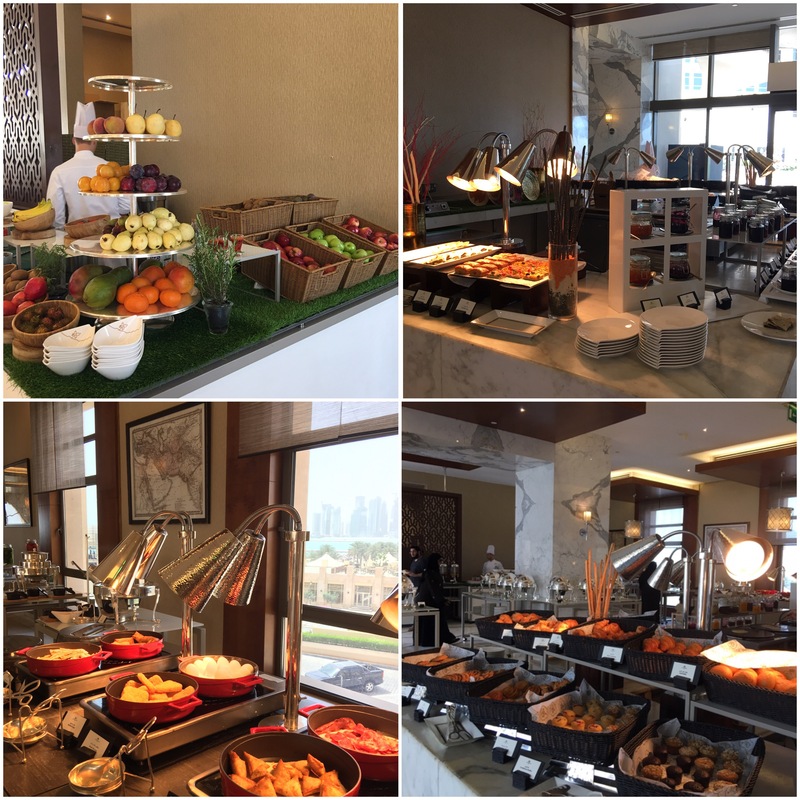 There was a selection of pastries, cereal, fruit, western hot dishes, Arabic hot dishes and an egg station. The fresh omelets were nice and, although slightly unusual for breakfast, I loved the sticky toffee pudding! Again, we were able to use an Entertainer voucher so breakfast was 241. We went back to our room, packed and checked out at 11am, again the front desk staff were efficient. We were asked if we’d enjoyed our stay and they checked all our SPG points had been added to our account, which they had. 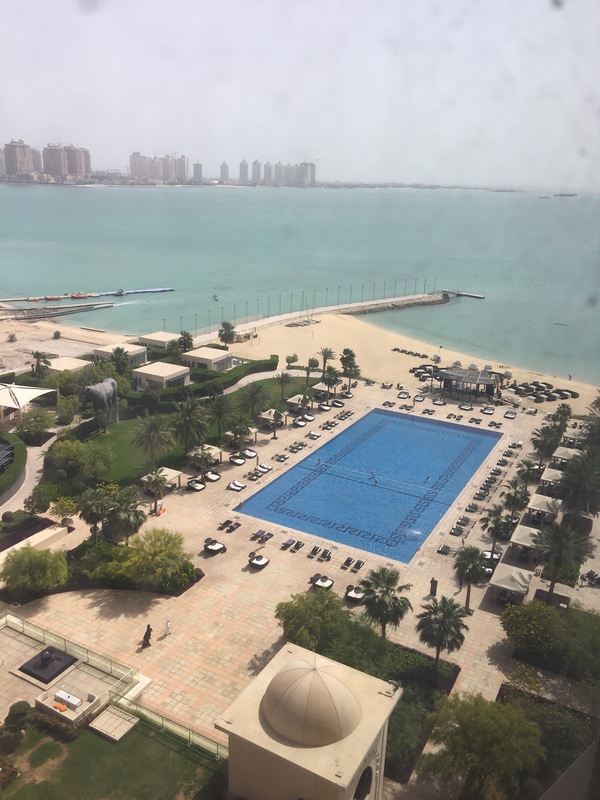 We paid 1170QR for a two night stay on a ‘room only’ basis as we used a 241 Entertainer voucher; all our food and drinks were extra. We were able to use our Entertainer voucher when dining at the Astor Grill, Opal and Vine which significantly reduced our bill. 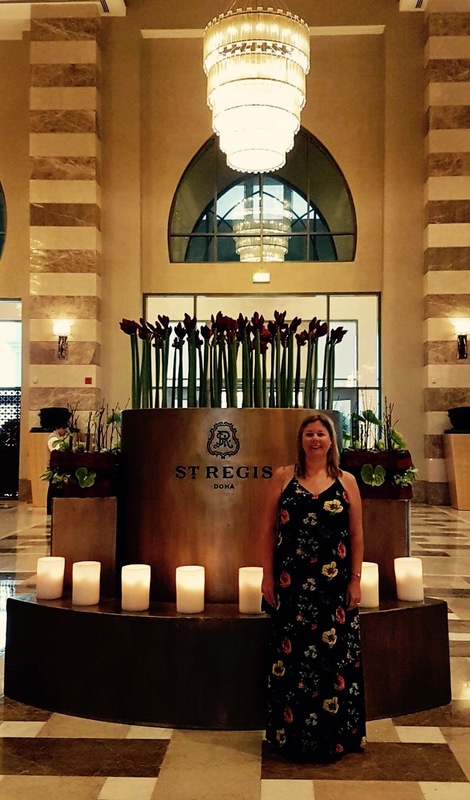 The St Regis is part of the SPG scheme so you can gain points on your stay and when you dine in the restaurants, although we couldn’t get the 10% discount as we were already using an Entertainer. Would I go again? Yes, we enjoyed our stay at the St Regis. The room was very comfortable with a lovely view, the food was good and it was a relaxing stay. There were a couple of issues with our room namely toiletries not being replaced, no turn down service on the second night and the lights not working properly but they were addressed. 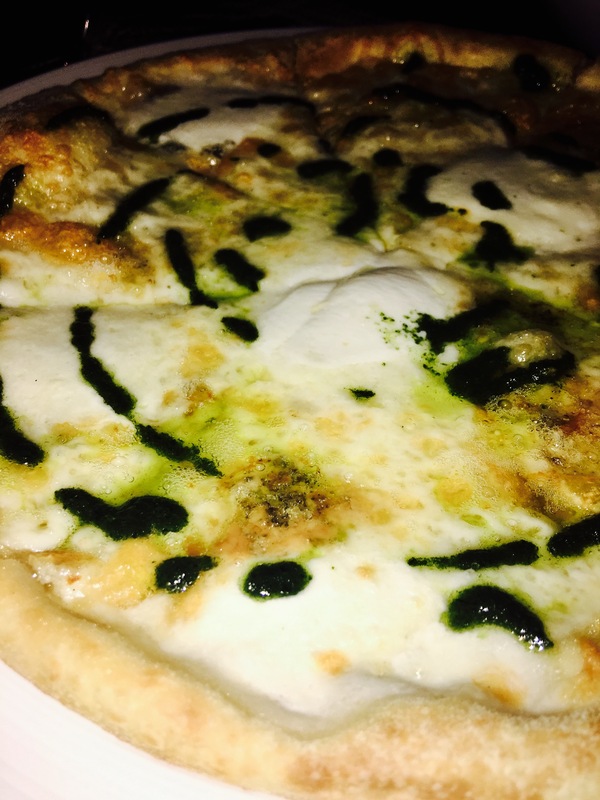 I also felt that the staff could be warmer, they are polite and helpful but it felt a little forced (other than the manager in the Astor Grill who is personable). 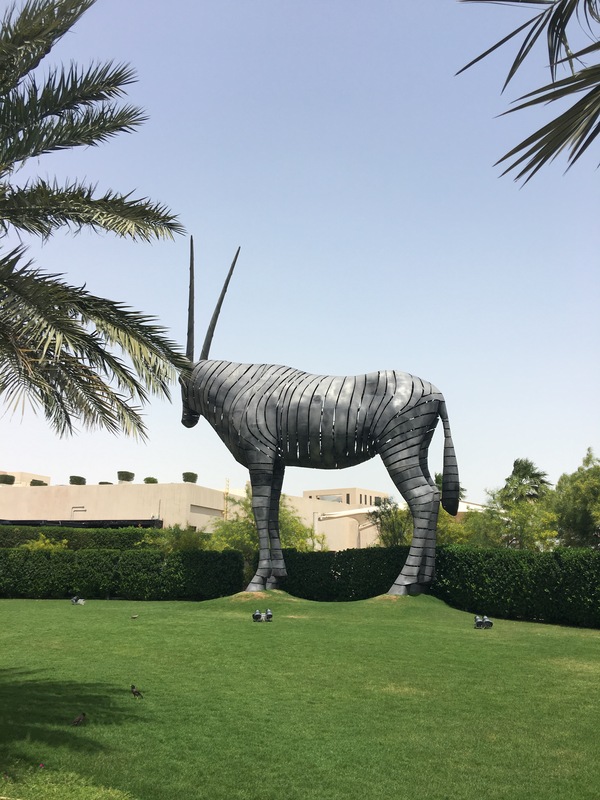 If you’re already in Doha and looking for a staycation it did feel like an escape from city life. 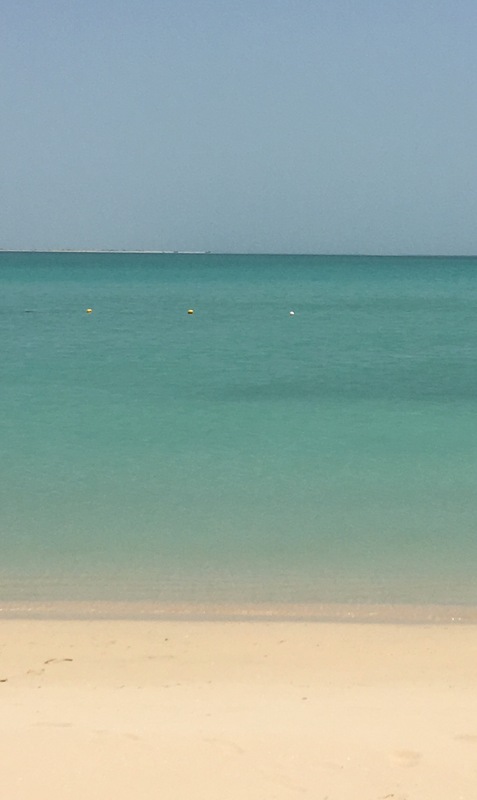 If you’re visiting Doha it’s about a 35min ride from the airport and very close to Katara and West Bay. The Pearl, Souk Wakif and the malls are about a 15min drive in light traffic. Haha, thanks Sally. I’ll tell Greg that, he needs to apply for more jobs in Qatar! Need to tell my husband about this. He was looking for a staycation for next week! We really enjoyed it, it’s def cost effective to use an Entertainer and a SPG card. There’s a great children’s pool if you’re taking the little one with you!